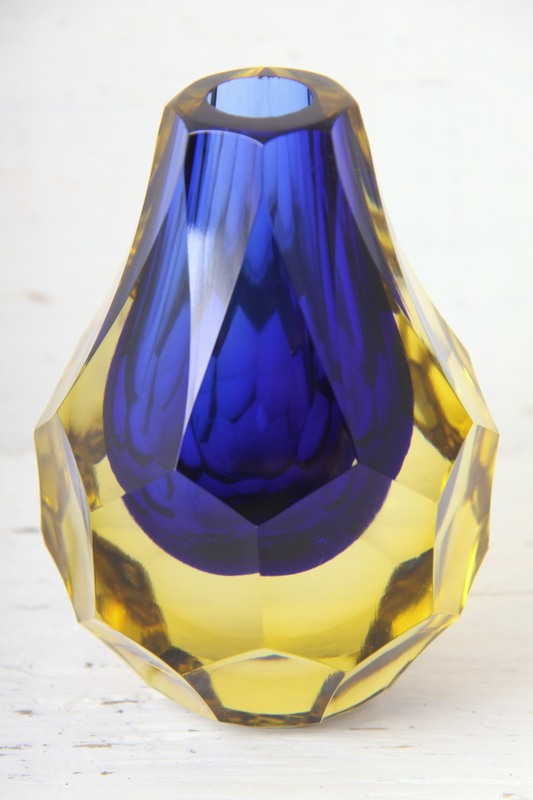 Faceted Sommerso glass vase, made by Mandruzzato, Murano, circa 1970’s. This is a Beautiful Art glass vase, made by Mandruzzato, Murano, Venice, Italy circa late 1960’s / 1970’s. A Stunning piece with an unusual form, the octagonally faceted body is shaped like a geometric pear / teardrop. Perfect for use as a small posy / solifleur vase, also ideal as a paperweight, pen or candle holder to adorn any desk or table. Handmade blown glass using the Sommerso (submerged) technique, with the blue bowl encased in yellow glass, showcasing the skill and craftsmanship of the glassmakers of Murano. Catches the light beautifully through the multiple facets and Sommerso layers. Would make a Stunning addition to any collection of Murano / Venetian / Art glass and would complement any retro, vintage, mid century, space age, modernist, 60’s, 70’s, minimalist or contemporary interior. Measures 11 x 7.5 x 7.5cm / 4.25 x 3 x 3in. In Fantastic Condition, some small nibbles to the inner rim, and some light wear to the base (pictured) nothing to detract on display. The facets are all in Excellent Condition. 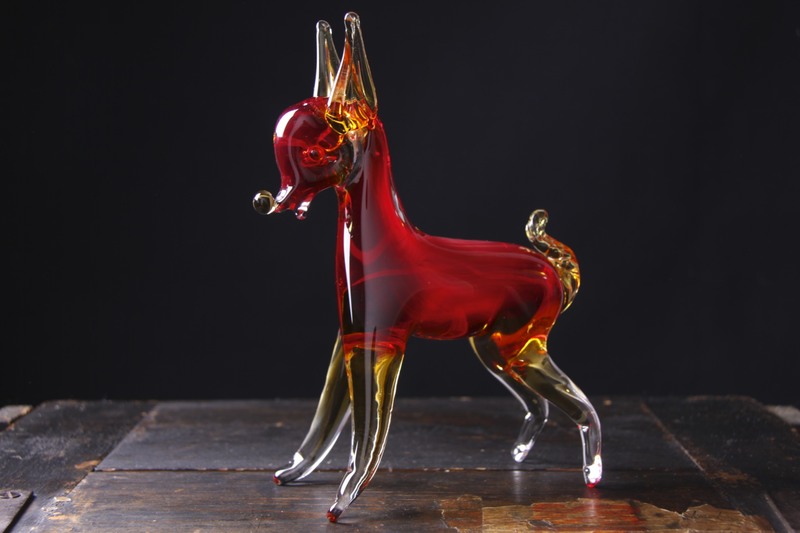 This is a Beautiful glass deer figurine, made in Murano, Venice, Italy circa 1950’s / 60’s. A Wonderful piece, the stylised deer / fawn / bambi figure has great detailing from the graceful legs to the pointy ears, bushy tail to ball nose! All in a Fantastic Sommerso glass in red, yellow and clear glass. Catches the light amazingly through the colours and curves. 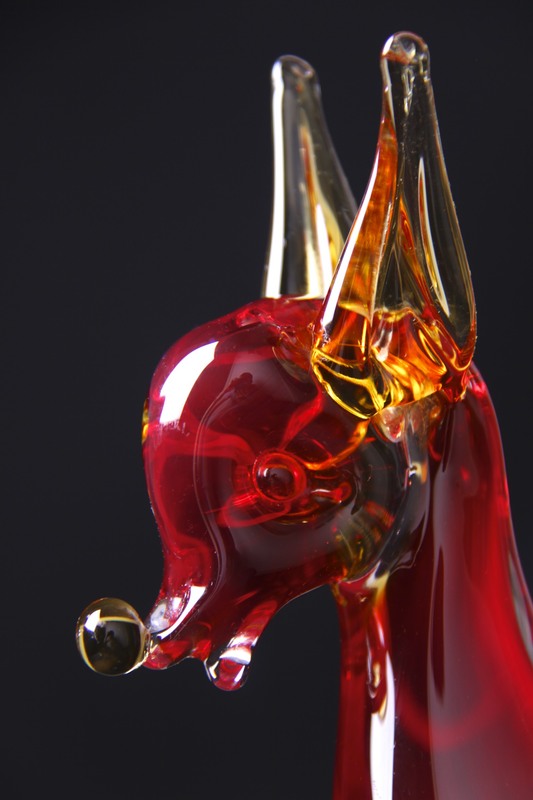 A Striking example showing the skill and craftsmanship of the glassmakers of Murano. Similar pieces were made by Cenedese, Seguso, AVeM, Flavio Poli and Fratelli Toso, and this is very reminiscent of the styles and output of the era. 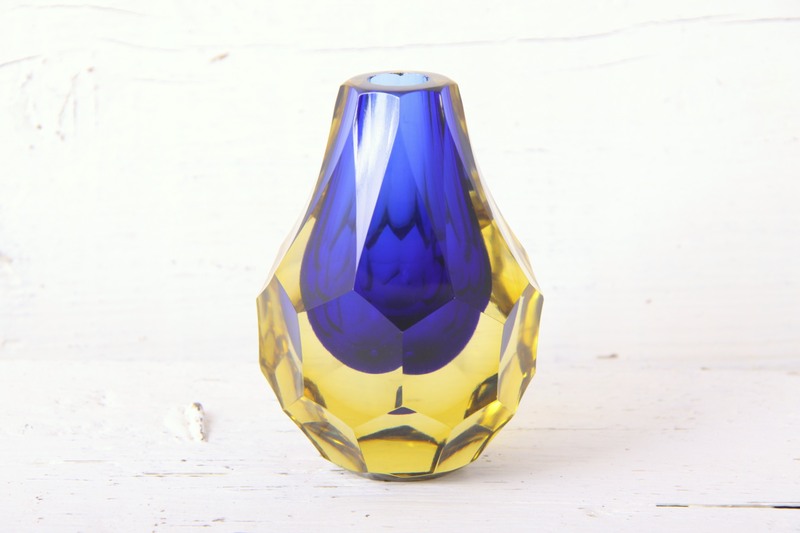 Would make a Stunning addition to any collection of Murano / Italian / Art glass, and would complement any retro, vintage, 50’s, 60’s, mid century, modernist, kitsch or contemporary styled interior. Measures 19 x 14.5 x 7cm / 7.5 x 5.75 x 2.75in.